Douglas A-20 Havoc Video - Newsreel - "Night Fighters"
The Douglas A-20/DB-7 Havoc was a family of American attack, light bomber and night fighter aircraft of World War II, serving with several Allied air forces, principally those of the Soviet Union, United Kingdom, and United States. The DB-7 was also used by the air forces of Australia, South Africa, France, and the Netherlands during the war, and Brazil afterwards. The bomber aircraft was known as Boston among British and Commonwealth air forces, while the RAF night fighter variants were given the service name Havoc. The USAAF assigned the DB-7 the designation "A-20" and gave it the popular name "Havoc". In March 1937, a design team headed by Donald Douglas, Jack Northrop and Ed Heinemann produced a proposal for a light bomber powered by a pair of 450 hp (336 kW) Pratt & Whitney R-985 Wasp Junior engines mounted on a high-mounted wing. It was estimated it could have carried a 1,000 lb (454 kg) bomb load at 250 mph (400 km/h). Reports of aircraft performance from the Spanish Civil War indicated that this design would be seriously underpowered and, subsequently, it was cancelled. In the autumn of the same year, the United States Army Air Corps issued its own specification for an attack aircraft. The Douglas team, now headed by Heinemann, took the Model 7A design, upgraded to 1,100 hp (820 kW) Pratt & Whitney R-1830 S3C3-G Twin Wasp engines, and submitted the design as the Model 7B. It faced competition from the North American NA-40, the Stearman X-100 and the Martin 167F. The Model 7B was maneuverable and fast, but did not attract any US orders. The model did, however, attract the attention of a French Purchasing Commission visiting the USA. The Neutrality Act of 1935 at the time forbade the sale of arms, including aircraft, to any nation at war, and President Roosevelt had just issued a call both for its revision and a rearmament program for the Air Corps. Aided by the Treasury Department's Procurement Division (headed by retired Naval officers) and Secretary of the Treasury Henry Morgenthau, Jr., the French discreetly participated in the flight trials, so as not to attract criticism from U.S. isolationists. The Air Corps, which controlled the aircraft's development but had been excluded from negotiations between the French, the Production Division, and the Navy's Bureau of Aeronautics, was directed by the White House on 19 January 1939 to release the DB-7 for assessment in contradiction of its own regulations. The "secret" was blown when the Model 7B crashed on 23 January while demonstrating single-engine performance. The French were still impressed enough to order 100 production aircraft, with the order increased to 270 when the war began. Sixteen of those had been ordered by Belgium for its Aviation Militaire. Although not the fastest or longest-ranged in its class, the Douglas DB-7 series distinguished itself as a tough, dependable combat aircraft with an excellent reputation due to its speed and maneuverability. In a report to the Aeroplane and Armament Experimental Establishment (AAEE) at RAF Boscombe Down, test pilots summed it up as "has no vices and is very easy to takeoff and land... The aeroplane represents a definite advantage in the design of flying controls... extremely pleasant to fly and manoeuvre." Ex-pilots often consider it their favorite aircraft of the war due to the ability to toss it around like a fighter. Its true impact was that the Douglas bomber/night fighter was extremely adaptable and found a role in every combat theater of the war and excelled as a true "pilot's aeroplane." When DB-7 series production finally ended on 20 September 1944, a total of 7,098 had been built by Douglas and a further 380 by Boeing. 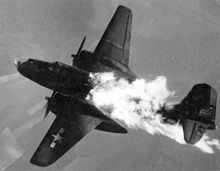 Picture - Douglas A-20J-10-DO, 43-10129, of the 416th Bomb Group destroyed by flak over Beauvoir, France on 12 May 44. The French order called for substantial modifications, resulting in the DB-7 (for Douglas Bomber 7) variant. 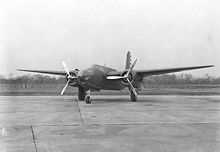 It had a narrower, deeper fuselage, 1,000 hp (746 kW) Pratt & Whitney R-1830-SC3-G radials, French-built guns, and metric instruments. Midway through the delivery phase, engines were switched to 1,100 hp (820 kW) Pratt & Whitney R-1830-S3C4-G. The French designation was DB-7 B-3 (the B-3 signifying "three-seat bomber"). The DB-7s were shipped in sections to Casablanca for assembly and service in France and French North Africa. When the Germans attacked France and the Low Countries on 10 May 1940, the 64 available DB-7s were deployed against the advancing Panzers. Before the armistice they were evacuated to North Africa to avoid capture by German forces. Here, they fell under control of the Vichy government, but saw practically no action against the Allies except briefly during Operation Torch. 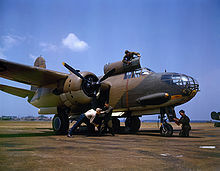 After French forces in North Africa had sided with the Allies, DB-7s were used as trainers and were replaced in frontline units by Martin B-26 Marauders. In early 1945, a few DB-7s were sent back to France where they saw action against the remaining isolated German pockets on the Western coast. Through Lend-Lease, Soviet forces received more than two-thirds of A-20B models manufactured and a significant portion of versions G and H. These aircraft were armed with fixed-forward cannons and found success in the ground attack role. The Royal Air Force agreed to take up the balance of the now-frustrated French order which was diverted to Britain, and the aircraft were given the service name Boston with the further designation of "Mark I" or "Mark II" according to the earlier or later engine type. The aircraft was generally unsuited for RAF use as its range was too limited for daylight raids on Germany. Many of the Boston Mk II, plus some re-engined Mk Is, were converted for night time duties - either as intruders with 2,400 lb (1,100 kg) bombs, or as night-fighters with AI Mk IV radar. These were known collectively as Havoc Mk I. A total of 181 Bostons were converted to Havocs. In interdiction raids, Havoc intruders caused considerable damage to German targets. 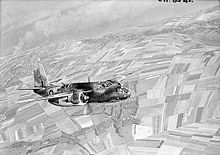 Twenty Havocs were converted into intruder aircraft, utilizing the Long Aerial Mine (LAM), an explosive charge trailed on a long cable in the path of enemy aircraft in the hope of scoring a hit. Trials conducted with lone Handley Page Harrows dropping LAMs into the stream of German bombers were not successful, consequently, the Havocs were converted back to Mk I intruders. A further 31 Havocs were fitted with a 2,700 million candela (2.7 Gcd) searchlight in the nose. They were unarmed and were supposed to illuminate targets for accompanying Hurricane fighters, but in practice the conspicuous light made them ready targets for German gunners. The French Purchasing Commission ordered a further 200 bombers, to be fitted with 1,600 hp (1,195 kW) Wright R-2600-A5B Double Cyclone engines. This variant was designated DB-7A by Douglas. None had been delivered before the fall of France, and they served instead as night-fighters with the RAF under the name of Havoc Mk II. They had an impressive top speed of 344 mph (550 km/h) at altitude. A total of 39 were used briefly in Turbinlite roles. The DB-7B was the first batch of the series to actually be ordered by Britain, in February 1940. Powered by the same engines as the DB-7A, with better armor and, crucially, larger fuel tanks, these were at last suitable for British use in the light bomber role. This was the batch for which the name "Boston" was first reserved, but since the commandeered DB-7s entered service first, this batch became known as the Boston Mk III. Amongst other operations, they took part in the attacks on the Scharnhorst, Gneisenau and Prinz Eugen during their dash through the English Channel (Operation Cerberus) and the infamous raid on Dieppe (Operation Jubilee). Three hundred were delivered and some were converted for use in intruder and night fighter roles. A French variant very similar to BD-7B, which again were diverted to England as Boston Mk IIIs. Many of these were built under licence by Boeing. Events further overtook this shipment after the German attack on the Soviet Union and the Attack on Pearl Harbor, when many Bostons were sent to the USSR and many more retained by the USAAF for its own use. Twenty-two were also sent to the RAAF by the British. A Netherlands variant intended for service in the Netherlands East Indies, but the Japanese invasion was complete before they were delivered. Part of this order was stranded in Australia on the so-called "lost convoy" and the first 31 Bostons were assembled at Richmond Airbase (NSW) and operated by 22 Squadron during the campaign against Buna/Gona and Lau on New Guinea. The assembly of these 31 was hampered by the manuals and instrument panels being completely in Dutch. The remaining aircraft in this order were sent to the Soviet Union under Lend-Lease which would receive 3,125 examples of different variants of the Douglas DB-7 series. Picture - T30 triple launcher for 4.5 in (114 mm) rockets. When shipments to the UK finally resumed, they were delivered under the terms of Lend-Lease. These aircraft were actually refitted A-20Cs known as the Boston IIIA. The original American indifference to the Model 7B was overcome by the improvements made for the French and British, and the Army Air Corps ordered two models, the A-20 for high-altitude bombing and the A-20A for lower-altitude work. Both were similar to the DB-7B, the A-20 was to be fitted with turbosupercharged Wright R-2600-7 engines, but these were bulky and the prototype suffered cooling problems, so the remainder were completed with the un-supercharged R-2600-11, 59 as P-70 fighters and 3 as F-3 reconnaissance planes (described below). 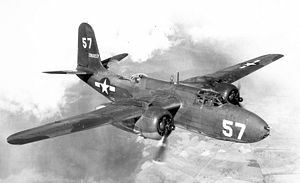 One A-20 was evaluated by the US Navy as the BD-1, while the US Marine Corps operated eight examples as the BD-2. The U.S. Army ordered 123 A-20As with R-2600-3 engines, and a further 20 with more powerful R-2600-11. They entered service in the spring 1941. The Army liked the A-20A because of its excellent performance and because it had no adverse handling characteristics. Nine of them were transferred to Australia in 1943. The British name "Havoc" was adopted for the A-20A. The A-20B received the first really large order from the US Army Air Corps: 999 aircraft. They resembled the DB-7A rather than the DB-7B, with light armor and stepped rather than slanted glazing in the nose. In fact, 665 were exported to the Soviets, so relatively few actually served with the USAAC. Picture - A-20C being serviced at Langley Field, Virginia, 1942. The A-20C was an attempt to standardize a common British and American version, produced from 1941. It reverted to the slanting nose-glass and had RF-2600-23 engines, self-sealing fuel tanks and additional armor. They were equipped to carry an external 2,000 lb (907 kg) naval torpedo. A total of 948 were built for Britain and the Soviet Union, but many were retained by the USAAF after Pearl Harbor. The Soviet A-20s were often fitted out with turrets of indigenous design. Picture - A-20G Havoc displayed at the National Museum of the U.S. Air Force. The A-20G, delivered from February 1943, would be the most produced of all the series - 2850 were built. The glazed nose was replaced by a solid nose containing four 20 mm (.79 in) Hispano cannons and two .50 in M2 Browning machine guns, making the aircraft slightly longer than previous versions. After the first batch of 250, the unreliable cannon were replaced by more machine guns. Some had a wider fuselage to accommodate a power driven gun turret. Many A-20Gs were delivered to the Soviet Union. The powerplant was the 1,600 hp (1,200 kW) R-2600-23. US A-20Gs were used on low-level sorties in the New Guinea theatre. 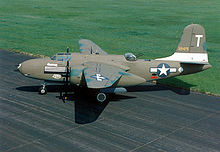 In 1948, the last surviving A-20H in United States service was redesignated "B-20" with the elimination of the 'A for Attack' category, and was given the 'Z' prefix as being obsolete. In October 1940, the USAAC felt a need for long-range fighters more than attack bombers, so some of the production run of A-20s were converted to P-70 and P-70A night-fighters. They were equipped with SCR-540 radar (a copy of British AI Mk IV), the glazed nose often painted black to reduce glare and hide the details of the radar set, and had four 20 mm (.79 in) forward-firing cannon in a ventral bomb bay tray. Further P-70 variants were produced from A-20C, G and J variants. The singular airframe P-70B-1 (converted from an A-20G) and subsequent P-70B-2s (converted from A-20Gs and Js) had American centimetric radar (SCR-720 or SCR-729) fitted. The P-70s and P-70As saw combat only in the Pacific during World War II and only with the USAAF. The P-70B-1 and P-70B-2 aircraft never saw combat but served as night fighter aircrew trainers in the US in Florida and later in California. All P-70s were retired from service by 1945. The F-3A was a conversion of 46 A-20J and K models for night-time photographic reconnaissance (F-3 were a few conversions of the original A-20). This variant was employed in the European Theater by the 155th Photo Reconnaissance Squadron which began its deployment as the 423rd Night Fighter Squadron. The 423rd was converted to its photo mission as the 155th Photo Reconnaissance Squadron in part because of knowledge of night fighter tactics which could be used to defend against German aircraft. Although the armament was removed, the crew of three was retained, consisting of a pilot, observer, and navigator. The first Allied aircraft to land at Itazuke, Japan after the August 1945 surrender was an F-3A. One A-20A was bought in 1940 by the United States Navy for evaluation for use by the United States Marine Corps. The Navy/Marine Corps did not have any priority on the production lines, so the DB was not put into service. In 1942, eight former Army A-20Bs were diverted to the United States Navy for use as high-speed target tugs. 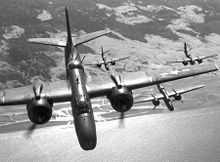 Despite the addition of the target-towing equipment and the removal of all armament and the provision to carry bombs, the aircraft were still designated DB in the Bomber sequence. They were withdrawn from service in 1946. An observation/reconnaissance version of the A-20B powered by two 1,700 hp (1,268 kW) R-2600-7 engines. The original order for 1,489 aircraft was canceled and none were built. A small number of surviving airframes exist both in flyable and static display condition in museum collections worldwide. 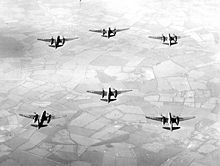 Picture - A-20s in bombing formation during World War II. Picture - A flight of A-20G or H bombers over France, 1944. Gunston, Bill. The Osprey Encyclopedia of Russian Aircraft 1875-1995. London: Putnam, 1995. ISBN 1-85532-405-9.